Former world No. 1 Venus Williams suffered a shock defeat to Chinese player Wang Qiang in the French Open first round yesterday. Wang Qiang reacts after beating Venus Williams 6-4, 7-5 in the French Open first round in Paris yesterday. 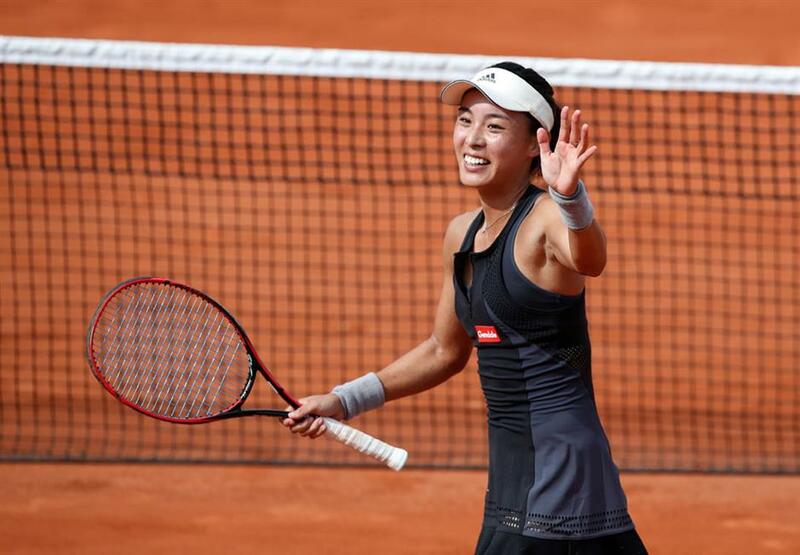 The 37-year-old ninth seed was well short of her best as Wang claimed a 6-4, 7-5 victory and gained a measure of revenge for her first-round loss to the American at Roland Garros last year. Wang, the world No. 91, has never made the third round of a Slam, and will face Petra Martic of Croatia for a place in the last 32 after the biggest win of her career. Martic brushed aside Wang’s compatriot Wang Yafan 6-2, 6-3. World No. 9 Venus will now turn her attention to playing the doubles tournament with her sister Serena, who is competing in a Grand Slam event for the first time since last year’s Australian Open after giving birth to her daughter. Another of Wang’s fellow Chinese, Zheng Saisai, also fell by the wayside, losing to doubles specialist Ekaterina Makarova of Russia 4-6, 1-6. Elsewhere, reigning US Open champion Sloane Stephens needed less than an hour to move into the second round on the opening day of the claycourt major. The 10th-seeded Stephens advanced at Roland Garros with a 6-2, 6-0 victory over Arantxa Rus of the Netherlands. It was Stephens’ first win at a Grand Slam tournament since claiming her first major title in New York last September. The American, who lost in the first round at the Australian Open in January, hit 17 winners and spent just 49 minutes on court on Day 1 in Paris. Rus was in the first round as a “lucky loser”. On a sunny and warm day, Stephens was joined in the second round by fourth-seeded Elina Svitolina, who defeated Ajla Tomljanovic, 7-5, 6-3 after recovering from a 1-5 deficit in the opening set. In the men’s draw, fourth-seeded Grigor Dimitrov found out about his opponent around 30 minutes before stepping onto Court Philippe Chatrier but had no problem adapting to the situation. Dimitrov, a semifinalist at Monte Carlo this season, was slated to play Viktor Troicki but instead faced Mohamed Safwat of Egypt because Troicki withdrew with pain in his back. Dimitrov hit 31 winners and prevailed 6-1, 6-4, 7-6 (1). Safwat, the first Egyptian man to compete at a Grand Slam since Tamer El Sawy at the 1996 US Open, was cheered off the court. Gael Monfils, one of six Frenchmen in action yesterday, overcame a slow start and an upset stomach and headache to advance by defeating compatriot and wildcard Elliot Benchetrit. Monfils won 3-6, 6-1, 6-2, 6-1.